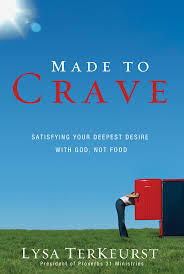 I am just over half way through week one of the Proverbs 31 Made to Crave On-line Bible Study and all I can say is, “why did I wait so long to read this book?!”. The P31 On-line Bible Study leaders have chosen a theme word for each week. This week’s word is EMPOWERED. As I placed the accompanying refrigerator sign prominently on the front of our freezer door, my husband said, “What the heck does that mean?”. At the time, I really couldn’t answer him. It took me some time to come up with an answer, but I think that I have finally got it. First and foremost, it means that I am empowered by God on this journey towards both mental and physical health. But it also means that I am empowered to not eat the ice cream in the freezer. I am not being deprived of the ice cream in the freezer. It is a slight mental shift, but such an important one. It is my choice to not eat the second portion at dinner because I know that it is going to be better for me in the long run. There is no outside force depriving me of all the good foods in life. I am not missing out on something. I am choosing the better road. The result of either attitude is the same––eating less––but choosing to feel empowered to make good choices versus feeling deprived is going to make the journey so much more enjoyable.